This will involve primary & extensive secondary research to cull out and shortlist the top 30 brands in each defined ranking category using the explicit metrics designed for each ranking category for stage 1. This will involve primary & secondary research to cull out and shortlist the top 10 brands in each defined ranking category using the explicit metrics designed for each ranking category for stage 2. A panel of jury members comprising of Brand Consultants, Marketing experts and Social Commentators, will judge the shortlisted entries on various parameters including – Idea and Innovation, Consumer Connect, Communication Impact, and Execution and Results. Jury holds the final discretionary power to eliminate / add any brand to the list. 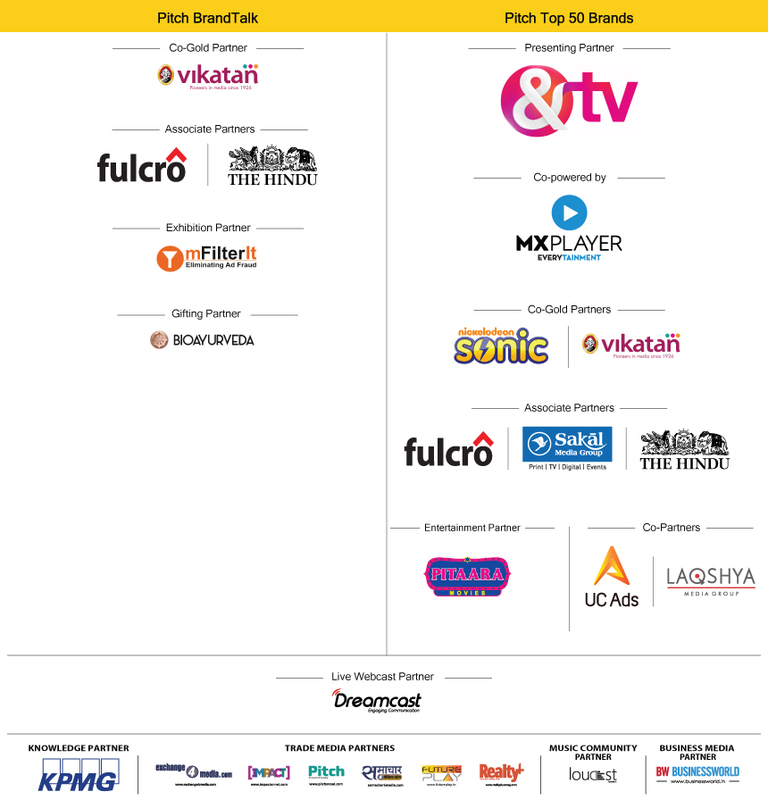 Pitch brings to you the e4m Pitch Top 50 Brands, an annual property of Pitch, from the exchange4media Group with an objective to unveil the top 5 brands in 10 categories. The list is a means to acknowledge the impactful, efficient and commendable marketing practices being upheld by brands in various categories. The process aims to identify the best approaches with respect to idea and innovation, consumer connect, communication impact, execution and results. This identifies brands that take the ownership of doing well for the society. This can manifest through a great public awareness campaign, supporting a cause, raising money etc. We are definitely looking at brands who have been doing the same over the last year and was not a one-off publicity stunt. The top brands here should have ideally gained a lot of traction with the issue that they raised / supported. Need to determine if projects launched or work in progress. Key information on scale, Impact & consistency should be mentioned. These are classic and timeless brands that we have seen over the last few decades. The eligibility here is at least 25 years. This category will look at brands that have managed to adapt itself based on changing market trends and continue to be successful today. Should ideally have had some form of brand revamp in the last year. Key information must have continued consistent performance numbers. These are the brands which made a resounding entry into the market. This includes completely new brands as well as strong brand extensions in a completely new category. The brand should have had launched in the last year – and have had shown its impact in the market through various means – advertising, positive word of mouth etc. Output should be part of criteria. These are brands that have challenged the conventional thinking in the market, and they did this not by merely replicating a previous business model but by completely redesigning the market based on customer insight. These are brands that were not afraid to step out of the mould of their industry. Ability to identify gap in the market. Ability to be mobile and nimble; cutting middleman if required. These are technology driven brands. It might be a technology product (like an app) or a technology enabled product. It is important that technology is integral to the brand functioning and creates a core competency. It is not necessary that the company sells a technology product. It is possible that it is using off – the – shelf technology (like online advertising) – but if the same is being used in a completely unique way and is enabling the company to reap success – the same would also be considered. Should only have brands that are technology driven. Or those that have a significant focus on technology as opposed to both previous years & other traditional media in current year. This identifies brands that have made a comeback in the market. While this need not look typically at rags to riches stories, there does need to be an element of a brand losing its market space and managing to recover the same through concerted efforts. This can also include brands that were in the spotlight for some wrong reasons eg poor customer feedback; but managed to win back customers. Issues either business or marketing/PR need to be highlighted. This will look at brands that have managed to establish connect with people. The approach might be different (for example a master connector might be a FMCG company OR a person) but the effort is directed at being a people – brand. Over the last year – these master connectors would have their own legion of followers. For this category, scale is definitely very important. A niche product that managed to have a cult following might not have the scope to be awarded a high rank here. People's brand. Key information must share scale & numbers. These are brands that have spread their roots worldwide. It is important here that the brand should have had organic growth eg expansion of Indian brands into foreign markets. While acquisition of foreign brands can also be considered, typically that will receive less weight. Consistency in performance across geographies, localizing the product/service and expansion in the last year. Key information must have data points on output, performance and scale. These are brands that are aimed at the masses. This need not be looked at merely from a rural viewpoint – but as an approach towards the masses (eg sub-urban). It is crucial here that these brands have huge volumes; and more importantly are developing the category, and not merely being a cheap inferior alternative to the leader in the market. The product positioning should genuinely be value for money and not compromising on any front. The category honors and celebrates the most effective way to communicate gender sensitivity/equitable nature by a brand or modification of behavior by raising awareness of gender equality concerns. The brands who have made a remarkable contribution to championing gender balance and equality of opportunity. © Pitch Top 50 Brands 2019. All Rights Reserved.